President Obama has made a deal with the devil. And in the process, he has betrayed our greatest ally, Israel. The Iranian leaders must be dying laughing. George Santayana (1863-1952), a Spanish-born American philosopher once observed, "Those who cannot remember the past are condemned to repeat it." That is precisely what we are witnessing today as President Obama tries to convince Congress that it must approve the nuclear deal he has negotiated with Iran. Our President has evidently forgotten British Prime Minister Neville Chamberlain's experience with Hitler in 1938. In 1936 Hitler sent German troops into the Rhineland, and in March of 1938 he annexed Austria. It was clear that the next object of his aggression would be the Sudetenland. This was the western end of Czechoslovakia that was occupied primarily by German-speaking people. In September of 1938, the Prime Minister of England, Neville Chamberlain, flew to Munich, Germany to meet with Hitler. He agreed to allow Hitler to take the Sudetenland if Hitler would promise that he would make no more territorial demands in Europe. 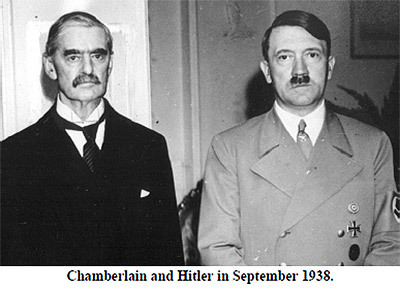 Chamberlain believed that he could appease Hitler. When Chamberlain arrived back in England, he held up the paper he and Hitler had signed and proclaimed, "We have peace for our time." We have suffered a total and unmitigated defeat... you will find that in a period of time which may be measured by years, but may be measured by months, Czechoslovakia will be engulfed in the Nazi regime. We are in the presence of a disaster of the first magnitude... we have sustained a defeat without a war, the consequences of which will travel far with us along our road... we have passed an awful milestone in our history, when the whole equilibrium of Europe has been deranged, and that the terrible words have for the time being been pronounced against the Western democracies: "Thou art weighed in the balance and found wanting." And do not suppose that this is the end. This is only the beginning of the reckoning. This is only the first sip, the first foretaste of a bitter cup which will be proffered to us year by year unless by a supreme recovery of moral health and martial vigour, we arise again and take our stand for freedom as in the olden time. Churchill proceeded to sum up his feelings about the Munich Pact with these words: "England has been offered a choice between war and shame. She has chosen shame, and will get war." Churchill's warnings proved to be prophetic. Six months later in March of 1939, German troops took all of Czechoslovakia. And one year after the Munich Pact, in September of 1939, Hitler invaded Poland, and World War II began. Chamberlain responded to the German aggression by observing, "Everything would have been all right if Hitler hadn't lied to me." Duh! Why did Chamberlain ever think otherwise? The answer to that question is that Chamberlain was a Humanist who could not grasp the inherent evil of Man. In like manner, President Obama has put his naive faith in the Ayatollah Khamenei who has promised "to erase Israel from the map." Obama's incredible trust in the world's number one terrorist leader is summed up brilliantly in Michael Ramirez's editorial cartoon below. 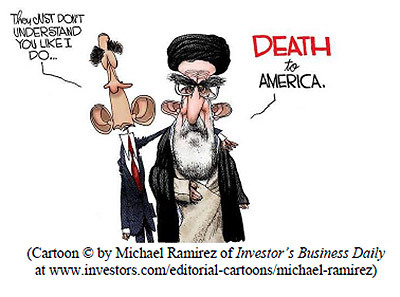 The deal with Iran paves the way for them to produce an atomic weapon. The deal is a blatant betrayal of our staunchest ally, Israel. President Obama has held Israel in contempt from the moment he took office. He has sought the favor of the Muslim world by marginalizing Israel and its leaders. He has repeatedly treated Israel's Prime Minister like he was the leader of a Latin American banana republic. Like Chamberlain, who refused to allow the Czech leaders to participate in his negotiations with Hitler, Obama has refused to allow the Israelis to participate in his negotiations with Iran. And, in fact, spokesmen for his Administration have condemned the Israelis for "spying" on the negotiations. Israel is a tiny nation that is only 300 miles long and 75 miles wide. It is the size of the state of New Jersey. One atomic bomb exploded over Tel Aviv would destroy the nation. Those not killed in the blast would die from the radiation, even people in Jerusalem because of the prevailing winds from the ocean. There is no way that the Israeli leaders can sit on the sidelines and allow Iran to produce an atomic weapon when the Iranian leaders have made it crystal clear that they will use the bomb to annihilate Israel. But Obama and the world could care less because the world hates the Jews with a passion. And so, our President tries to calm the Israelis with paternalistic assurances that the United States will look after them. Any Israeli leader with any knowledge of history and any sense of realism will not buy such assurances. What we are doing is forcing the Israelis to take military action. And when they do so, you can be assured that the whole world will condemn them, just as they did in 1981 when Israel destroyed the Iraqi nuclear reactor that was being built near Baghdad. Most significantly, our nation's leaders are ignoring the warnings of Scripture that God will bless those that bless Israel and will curse those who curse Israel (Genesis 12:3). Our President enjoys poking Israel in the eye despite the warning that the nations that mistreat Israel are touching the "apple of God's eye" (Zechariah 2:8). Further, Joel 3:2 warns the nations of the world that God will judge any of them who come against Israel in the end times and try to force the Jewish people to divide their land. It is indeed naive and very stupid to think that obama is naive. He came into this presidency knowing full well what he was going to do. Nobody read his books or they would have realized what he was about. Totally deceived and you people helped him, voting for him....................twice.....unbelieveable.....but did it anyway. Thanks for the significant and timely information shared here! God bless you and this ministry! I never thought the USA would turn it's back on Israel. There's a lot of things I never thought would happen regarding the USA. But with Obama everything I never thought would happen is becoming reality. Obama is helping to pave the way for the antichrist. Obama is AN (not THE) antichrist. Obama is helping to set up the world for the Psalm 83 and Gog/Magog wars. Everything is falling into place before our eyes. Incredible!!! Though, as Christians aware of end times prophecy, I think we deep down never thought it would come upon so quickly. And yet it is here, upon us now. Just as the Bible told us "As it was in the days of Noah, so it will be at the coming of the Son of Man." WOW!!! As I do my weekly Bible study at work with a Christian friend during lunch (we are currently studying Revelation) I sit there is awe as we read about all the horror that is upon the world. And yet, it seems almost everyone is clueless of the catasrophe about to happen. Again, just as the Bible told us "For in the days before the flood, people were eating and drinking, marrying and giving in marriage, up to the day Noah entered the ark..." WOW!!! But thank God, praise the Lord for our deliverance is NEARER than the horrors to come. For God will spare us and we shall escape in the Rapture. The Word says "Peace I leave with you; my peace I give you. I do not give to you as the world gives. Do not let your hearts be troubled and do not be afraid." and "For the Lord himself will come down from heaven, with a loud command, with the voice of the archangel and with the trumpet call of God, and the dead in Christ will rise first. After that, we who are still alive and are left will be caught up together with them in the clouds to meet the Lord in the air. And so we will be with the Lord forever. Therefore encourage one another with these words." Peace be with you all, my Christian brothers and sisters. Be ecouraged. Be hopeful. Jesus is almost here. Be ready.